Companion bills introduced in the House and Senate are calling for coins in commemoration of the centennial establishment of the Tomb of the Unknown Soldier. On March 4, 1921, Congress approved the burial of an unidentified American soldier from World War I in the plaza of the Memorial Amphitheater. The memorial site at Arlington National Cemetery in Virginia now honors unknown soldiers who died in World War I, World War II, Korea, and Vietnam. The tomb is guarded 24 hours a day, 365 days a year, and in any weather by Tomb Guard Sentinels. "Since the first burial in 1921, the Tomb of the Unknown Soldier has been a powerful symbol in American history. This commemorative coin will honor the storied legacy of the nameless Americans who made the ultimate sacrifice for our nation" said Congressman Brad Wenstrup. "So long as the Sentinels remain on patrol, the memory of our unknown war dead will never pass from the hearts of the American people." The Sentinels, all volunteers, are considered to be the best of the elite 3d U.S. Infantry Regiment, known as "The Old Guard." The Tomb of the Unknown Soldier Centennial Commemorative Coin Act, numbered H.R.6635 in the House and S.3290 in the Senate, calls for up to 100,000 silver dollars with designs emblematic of the centennial anniversary of the memorial. Final designs would be selected by the Secretary of the Treasury after consulting with the Society of the Honor Guard, the Tomb of the Unknown Soldier, and the Commission of Fine Arts. They would also be reviewed by the Citizens Coin Advisory Committee. The dollars would be issued in collector qualities of proof and uncirculated, dated 2021, and sold during the 1-year period beginning on Jan. 1, 2021. They would also bear standard inscriptions and be composed from at least 90% silver. Under terms of the Act, a surcharge of $10 would be added to the price of each coin. Proceeds from their sales, provided they turn a profit, would benefit the National World War I Museum and Memorial for the purposes of assisting in commemorating the centennial. Both Senate and House bills were introduced on July 26. 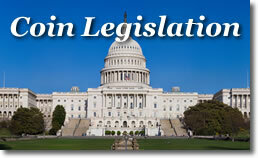 Senators Tom Cotton (R-AR) and Richard Blumenthal (D-CT) introduced S.3290. Congressmen Brad Wenstrup (R-OH) and Don Beyer (D-VA) introduced H.R.6635. I fear in 10 years it will be for the tomb of the unknown COIN COLLECTOR(S)! i enjoy coins and coin collecting as much as anybody, but some things are sacred and should not be done. This is one I contacted a few Representatives about in January, 2016. My uncle was a Tomb Guard. I never thought it was going anywhere. Kind of shocked when a friend sent me this today.